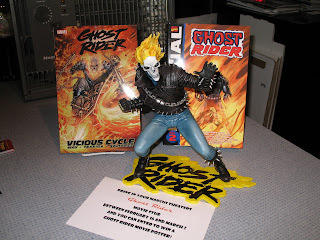 We have a couple Ghost Rider displays in the store - to get interest in the character up before the movie. It seems to be working, because we've been selling the graphic novels pretty well these last couple of weeks. This past Friday one of our regular customers** brought in a cool Ghost Rider statue that he made (as pictured) and I set up another display around it. It's pretty cool, and a couple of people have asked how much it was. I'm not sure if the movie will be any good; we'll have to wait a couple of weeks for that. But anytime a comic book becomes a movie it's usually a good thing for those of us in the business of selling "funny books." As cold as it's been these last few days, I wouldn't mind being Ghost Rider. Flames would feel good now. Today's HIGH is supposed to be -1 , maybe as high as 0 in Milwaukee proper. And that's BEFORE the wind-chill. Those temps are -20 or so, and the wind is pretty strong and constant. EVERYTHING looks frosty - the roads and cars are covered with salt that looks like frost, there's snow on the ground, many windows are frosting over, the sky is a blinding white - it's like EVERYTHING around here is trapped in an ice-cube. I hope you folks in the warmer climates (Ben) are enjoying the warmer temps! These are the days I wonder why I live here and wish I had the free time for a cruise to the tropics. Y'know...I really can't complain right now. 65 degrees is hilarious around here - people put on coats to go out in this weather! I'm out there in tshirts and shorts! They think I'm crazy! It's allllllllll relative, methinks. However, I'm sure the 123 degree heat in the summer is gonna make me want to visit Milwaukee a WHOLE LOT MORE this year.